Chloe Kim took snowboarding to new heights with a thrilling, gold medal-winning performance, Shaun White led a contingent Americans into the men's halfpipe final, and Team USA was aiming for a shot at its first gold medal in women's hockey in two decades. Here's a look at the 2018 Winter Games by the numbers. 17 — At 17, Chloe Kim became the youngest female snowboarding medalist in Olympic history. Kim blew her competition away during her Olympic finals debut, with two scores in the 90s to win the gold Monday night. On her first run, which went unbeaten by her competitors, Kim scored a 93.75. On the third run, which was a victory lap as she had already secured the win, she scored a near-perfect 98.25. 2 — Chloe Kim has tweeted twice during competition about being hungry or craving food. During the halfpipe final, Kim tweeted that she was "getting hangry” because she didn’t finish her breakfast sandwich. But there’s a chance that hunger fueled her — after tweeting, Kim put up the highest score of the night, 98.25. 4 — Shaun White made his debut in his fourth Olympics Monday night in the men’s halfpipe qualifying round with a near-perfect performance. After falling behind Australia’s Scotty James and Japan’s Ayumu Hirano in the first qualifying run, the two-time gold medalist scored a 98.5 in the second round to clinch the top spot. White was one of four Americans to qualify for the final, joining Ben Ferguson, Chase Josey and Jake Pates. White failed to medal four years ago in Sochi after winning gold in the halfpipe event in Turin and Vancouver. 6 — It’s been 20 years since the U.S. women’s hockey team won gold in the Winter Games, last doing so in Nagano. Since then, the Canadians have claimed the top spot in the last four Winter Olympics. 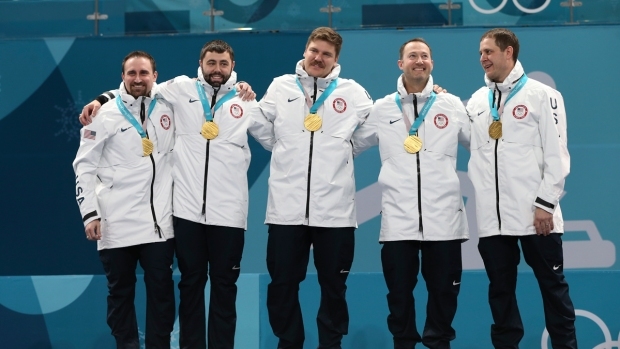 On the quest to reclaim gold, the U.S. dominated Olympic athletes from Russia Tuesday. They won 5-0. 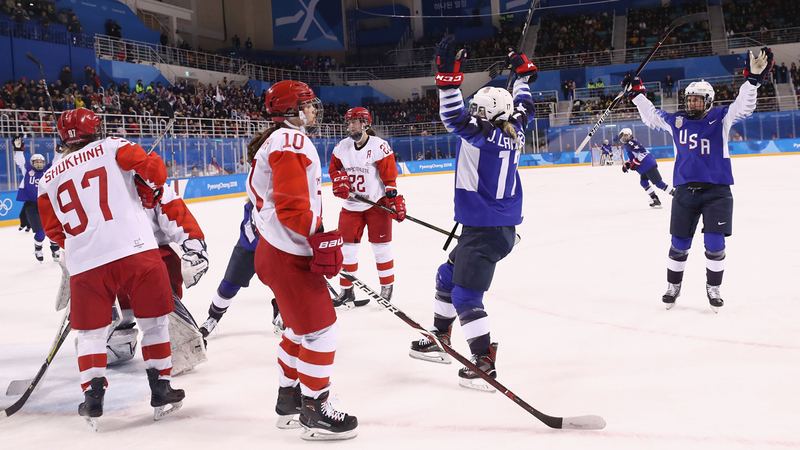 American Jocelyne-Lamoureux Davidson set an Olympic hockey record for the fastest consecutive goals by a man or woman, scoring six seconds apart in the second period. 1 — Alpine skier Marcel Hirscher won his first gold medal at an Olympics, ending the Austrian powerhouse's drought in the combined event. Hirscher had won the overall World Cup title for a record six consecutive seasons but his only previous Olympic medal had been a silver in 2014. 15 — The Winter Olympics features 15 sports from Alpine skiing to curling to luge to speed skating. The Summer Games has about three times as many sports. 6 - Canada became the first country to win mixed doubles curling in the event's Olympic debut in Pyeongchang. Canada’s Kaitlin Lawes and John Morris defeated the Switzerland team 10-0. Canada has now won six Olympic curling gold medals, NBC Olympics reported. 99 — Chloe Kim's star performance gave Team USA its 99th gold medal in Winter Games history. The U.S. has won six medals so far in Pyeongchang.